Grandpa's hoard of old stock certificates may be valuable. 1. How Do I Cash Unclaimed Stock Certificates? 2. What Is Included on a Stock Certificate? If you discover a deceased relative’s hoard of stock certificates from long-defunct companies, you could be rolling in money -- or not. When a company goes defunct because of a merger or acquisition, its stocks may still be redeemable for cash or securities of the successor company. 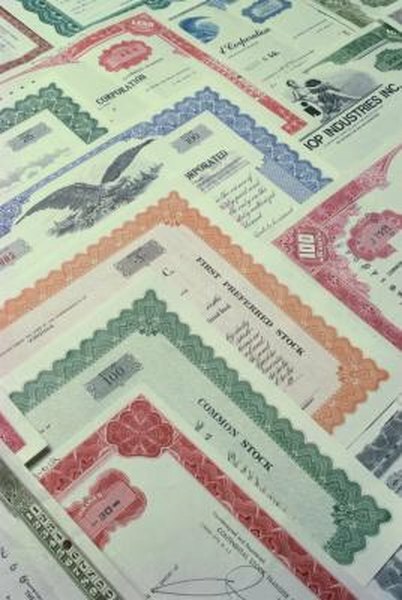 If the stock certificates do turn out to be legally worthless, they may still have some value as collectors’ items. The first step on the road to cashing in is to examine the certificates for telltale signs that they might still be legally valid. A valid stock certificate will bear the name of the person to whom it was issued. The company seals and signatures will be intact, not punched out or stamped over, and the back side will be clean and unmarked. If ownership of the shares represented by the stock certificate has been transferred to someone else, the certificate will bear stamps, signatures or seals on the back to indicate transfer of the shares, and the company signatures and seals on the certificate’s front will be canceled by punched holes or ink stamps. A canceled certificate no longer represents a legal claim on the assets of the company. Even if your stock certificates appear legally valid, they still might not be worth anything. The stocks of the vast majority of defunct companies are legally worthless, but yours could be that rare exception. You can do the detective work yourself through Internet and library resources. You can look up the company name or hunt for a stock by its unique CUSIP number if the certificate bears one. You can also check on a stock through the Secretary of State’s Office of the state where the company was incorporated. If you have a brokerage account, your stockbroker might be willing to do the research, or you can pay a stock research firm to do the work. If it turns out that the old stock still has legal value, you still must prove that you are a legal heir to the stock through a will or other trust document. Most stocks were registered to the original purchaser and belong to his legal heirs. They can’t be cashed in by just anyone. Some stocks were bearer instruments, meaning they could be cashed in by whoever holds the physical certificate. If you have uncanceled stock with legal value and can prove you are a legal heir to the shares, you can proceed with cashing in the stock. You can cash it in by contacting a transfer agent to have the shares transferred to your brokerage account at their current value, or you can ask your broker to cash in the stock for you and deposit the proceeds into your account. If it turns out that your old defunct stock has no value as a security, the certificate itself may have value as a collectible. Scripophily is the hobby of collecting old stocks, bonds and other financial paper, and the Internet has information on what may be a valuable collectible stock. For example, the website at www.Scripophily.com will let you search its collectibles stock database for free. Collector value depends on the company name, artistic design, certificate age and condition, and whose signatures are on the stock.